- directly on the ground - Lara is standing/crouching on the ground or floating in deep water, and reaching for the item. - on a pedestal - Lara is standing on the ground, and reaching for the item. 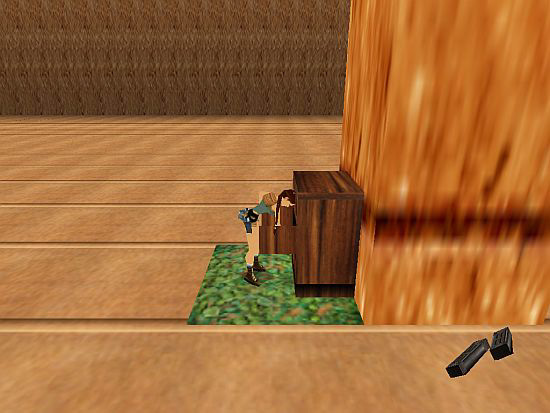 - tightly against a wall - Lara is standing on the ground, and getting the item using crowbar. - into a hole in a wall - Lara is standing on the ground, and reaching into the hole for the item. None of these specific methods requires special OCB-numbers! The method of the sarcophagus is the only one of methods from a to e that you encounter in the original TR4 game and Level Editor. Place the items Lara will get from the sarcophagus, on a square. Then place the sarcophagus (it's FURNITURE5 in cleopal.prj) on the same square to cover the pickable items. After that, place the sarcophagus lid (you can find this object as SARCOPHAGUS) on the sarcophagus. - Be aware: that side of the lid will be pushed by Lara where you can see the two black patches. (You can open each sarcophagus only once, because the opened lid remains open 'forever'. - And be careful: Lara puts something into her backpack at the end of her animation. So, if you want to use non-empty and/or empty sarcophagi on a level then you must re-edit the animation to make it useable for the empty ones as well. B, c, d and e methods are all from TR5. So, if you want to use them in NGLE then you must make them compatible with NGLE. The compatibility-adjusting operation is easy: put the container object into SARCOPHAGUS slot, then replace the sarcophagus-using animation by the animation that's for using that container, in #439 animation slot of LARA object. 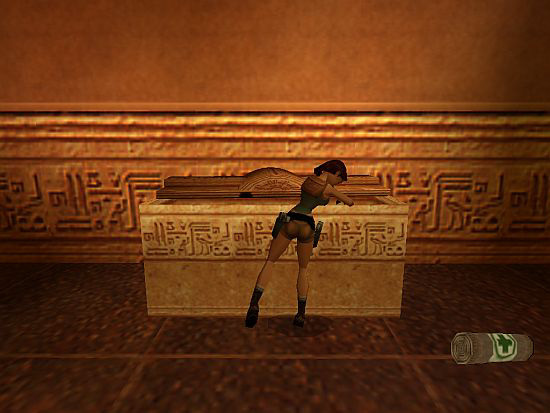 For example, if you want Lara to pick up the item from a box, then put a proper box object into SARCOPHAGUS slot, then replace Lara's sarcophagus-using animation by her box-using animation, in #439 animation slot. Check it: every special animation of Lara that this tutorial cares about must always have Animation11 as Next Animation. a, The animation be must be in Animation#0 slot. If it's not, then copy it there. b, Check the values: StateID/Next Animation/Speed/Accel=0, Next Frame=the last frame of this animation. c, State Change Editor must be empty. d, Check AnimCommands: only the required sound commands could be placed there. 'Die' and other special commands must be deleted. Instead of that, open Switch Manager of WADMerger. See the small SACROPHAGUS (!) window there. Choose 'Suitcase' entry then click on 'Save' to close the panel of Switch Manager. - Now you can see: the box-using animation has been put into Lara's Animation439 slot of your WAD. Every time when you open WADMerger, the values of Switch Manager will be goes back into their default states. So, if you open WADMerger, and then open Switch Manager to adjust something else there, then you also adjust 'Suitcase' again there everyway or else the box won't work properly if you close the Switch Manager with clicking on Save. So the box is in your WAD, with its and Lara's proper animations. Save the WAD and refresh it in your project. Place the items Lara will get from the box, on a square. Then place the box (SARCOPHAGUS) on the same square to cover the pickable items. Lara goes to the box. The player hits CTRL thereupon the box-using animation (439) starts: Lara kneels to the box, opens it, takes the item(s) out of it, then closes the box and stands up. So you need a proper object in SARCOPHAGUS slot. This object is a drawer now - you can find one for example in the WAD of TR5 Level 'The Submarine'. (You also have to find here a chest for the drawer. Place it into your WAD as well.) - Don't forget to adjust Animation0 of the drawer, the same way as you would do with the animation of the box above. Lara's drawer-using TR5 animation is Animation465. Open Switch Manager of WADMerger. See the small SACROPHAGUS window there. Choose 'Cupboard drawer' entry then click on 'Save' to close the panel of Switch Manager. - Now you can see: the drawer-using animation has been put into Lara's Animation439 slot of your WAD. Save the WAD and refresh it in your project. Place the items Lara will get from the drawer, on a square. Then place the chest on the same square. After that, place the drawer (SARCOPHAGUS) 'into the chest'. But you'll discover a problem: the chest is thin so it won't cover the pickable items on the middle of the square. And, if Lara goes to the drawer, then she'll reach down for the items to pick them up directly, and won't pull the drawer out. That's why you make these pickable items invisible in their OCB panel. But the setup still won't work: if Lara goes to the drawer, she won't pull it out. The problem is preventable if Lara steps back now one step and the player uses CTRL after that. But it's nonsense: requiring the stepping-back of the player so that the pulling-out will work properly? To really prevent the problem, adjust the collision box of the chest (using Fexanim for the ANIMATING chest or StrPix for the Static chest) to make (increase) its length half-square (512 units) sized (approximately). 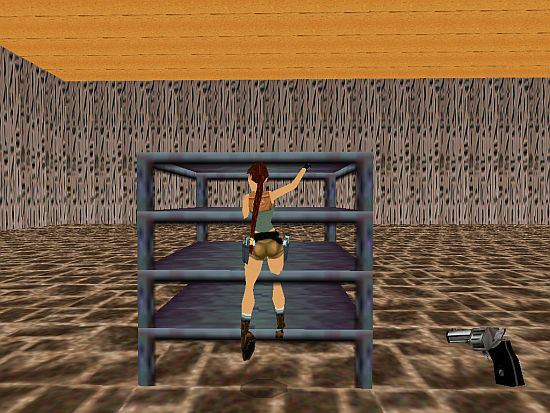 -In this case, Lara can't step to the chest because its collision box will prevent her from doing this. 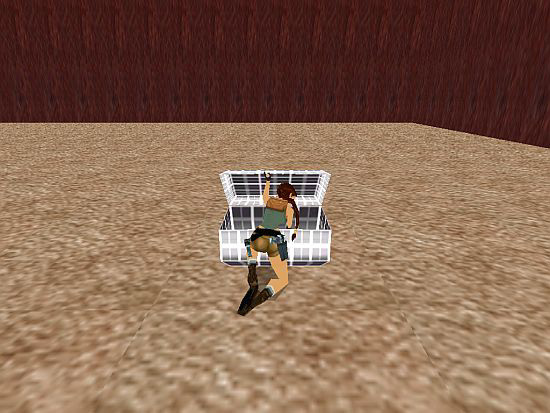 But now Lara will be able to pull out the drawer when she's been just stopped by the collision. She takes the item(s) out of the drawer, then pushes it back. (You can push out/pull back each drawer only once. - But this time you don't need to be careful: Lara doesn't put anything into her backpack at the end of her animation. So, this animation is usable for both non-empty and empty drawers.) No, it still isn't okay - the gap between Lara and the chest is too big. It's ugly - it seems as if Lara were rummaging not the drawer but the air before the drawer. Maybe you think it's a good prevention for the problem if you choose new coordinates for the chest and the SARCOPHAGUS drawer on that square (for example, by 'Move. Move , <#>animating for (E)units (one sector = 1024)' ACTION triggers). Forget it. It's just a time-wasting. So, if you want, then edit (or get) a drawer having a proper pivot. (Or you can search special solutions, for example, on TRSearch.) - That's not what I did. Instead of that I decided I would search for a new solution. - Put the Moveable chest into an - any - ANIMATING slot of your WAD (for example, ANIMATING1) or the Static chest into a - any - non-shatter Static slot of your WAD (for example, PLANT0). - Place the chest and the drawer on a square - but don't place any pickable item there! - Don't change any default collision now. TestPosition=1 command defines a position where Lara is very close to the drawer and - more or less - facing exactly that. b, and, after 3 seconds it starts TriggerGroup#4 (see: 3, 4). 5. So TriggerGroup#3 starts just when Animation#480 starts. It means the animation (the 'pulling-pushing') of ANIMATING2 (the drawer) starts just when Lara's drawer-pulling/pushing animation starts. In the third second of Animation480 Lara's just rummaging the drawer. It means a clip of Uzi ammo and (after that) a PUZZLE_ITEM3_COMBO1 will be added to inventory when Lara s just rummaging the drawer 'to find something'. 7. Maybe the player forgets (s)he's opened that drawer before so (s)he opens it again (and again) sooner or later. First of all, the Next Frame value for the Animation0 of the drawer is 0 now. - But what is it supposed to mean? Well, it means if the pulling-pushing animation of the drawer has just ended then it won't stop: the drawer will be pulled out then pushed back again and again, in loop mode. So it's doing that continuously even when Lara's not doing pulling animation. Of course, it's not good for us. But don't worry: we'll use some tools to regulate that uncontrolled move. As Animation0 of the drawer and Lara's Animation480 have the same length (see the amount of frames) it means Animation0 will be stopped in the proper moment: just when Lara's animation has ended. And, if Lara starts pulling out that drawer again, she starts the animation of the drawer again - from its first frame exactly -, activating TriggerGroup#3 again. 1. You need a FGT_SINGLE_SHOT_RESUMED flag for Animation=480 command, or else the 3 second counter will start only if the Animation480 has just been ended. 2. TGROUP_SINGLE_SHOT constant in TriggerGroup#4 is necessary or else Lara would get the pickable items at every pull of the drawer again and again. 3. The condition in GlobalTrigger#2 is "when Lara's performing Animation#480". It means the GlobalTrigger disables all the key commands (see TriggerGroup#5: $2000, 51, $0) when Lara's pulling/pushing a drawer, then enables them again (see TriggerGroup#6: $2000, 52, $0), if she's just pushed the drawer back. Why? Because, in spite of ENV_FREE_HANDS constant, the player could hit SPACE to draw a weapon and CTRL to shoot with it, while Lara's performing that animation, if you don't use that GlobalTrigger. a, You don't need TriggerGroup#3, #4 and Organizer#1. b, Write the same thing to TriggerGroup#2 (instead of $2000, 127, $1) what you should write to TriggerGroup#3 ($5000, 65, $2B). 5. Maybe you want to use more drawers - used by the new method - in your level. Taking the example where there are two non-empty drawers (both ANIMATING2) in the level, do all these things, forming Setup X.
a, Not GlobalTrigger#1, but another GlobalTrigger (#3) will work for the other drawer (or else, the items she should find in the first drawer could go to her when Lara's rummaging the second drawer first, and vice versa.). It means you have to use 'GlobalTriggers. <&>Enable/Disable the (E)GlobalTrigger' FLIPEFFECT triggers to locate the area where a Globaltrigger of a drawer works, and each drawer must be in the area where its GlobalTrigger is enabled. - Those areas are not allowed to be overlapped with each other! f, When you export an AnimCommand, and that is an ACTION trigger, then a panel will pop up (named 'what object'), asking you to click on Yes or No. If you click on Yes, then the AnimCommand will work as if we had attached a TGROUP_USE_FOUND_ITEM_INDEX constant to that. And now, we want Yes, because we want the stopping to work on not only the first drawer but also the second one. So delete the formerly exported AnimCommand from Animation0 and export the trigger again, clicking on Yes this time. (If all of your drawers are empty, then the setup in Note#4 is just perfect - except: TriggerGroup#3 must have a TGROUP_FOUND_ITEM_INDEX flag. First, copy GlobalTrigger#1, giving a new ID to that. - replace the ID of TriggerGroup#2 by the ID of TriggerGroup#3. - TriggerGroup#3 must have a TGROUP_FOUND_ITEM_INDEX flag. - You have to use the proper GlobalTrigger areas for the two drawers. The GlobalTrigger area of this empty drawer will work on all the empty drawers of ANIMATING2. c, because the difference between X and Z values is (relatively) too big, and that maybe matters. You need its own TestPosition (for example, #2) for ANIMATING3. It means you can't use MultEnvCondition#1 for ANIMATING3, because you must define a MultEnvCondition#2 with TestPosition#2. So, we've deleted MultEnvCondition=2 condition from Animation=480. The new condition instead of that is if the conditions in TriggerGroup#9 are true. So Animation480 will start either if Lara's standing in front of an ANIMATING2 drawer, with free hands, or if she's standing in front of an ANIMATING3 drawer, with free hands. And, lastly, use that 'Yes type' AnimCommand at both ANIMATING drawers, not only ANIMATING2. (The operation is the same - i.e. stopping a Moveable object-, so if ANIMATING3 will use that AnimCommand of ANIMATING2, it doesn't matter, because the object ID of ANIMATING3 will be the 'found index' when Lara wants to open an ANIMATING3 drawer. So you need a proper object in SARCOPHAGUS slot. This object is a cupboard now - you can find one for example in the WAD of TR5 Level 'Escape with the Iris'. - Don't forget adjust Animation0 of the cupboard, the same way as you would do with the animation of the box above. Lara's cupboard-using TR5 animation is Animation464. Open Switch Manager of WADMerger. See the small SACROPHAGUS window there. Choose 'Cupboard big doors' entry then click on 'Save' to close the panel of Switch Manager. - Now you can see: the cupboard-using animation has been put into Lara's Animation439 slot of your WAD. 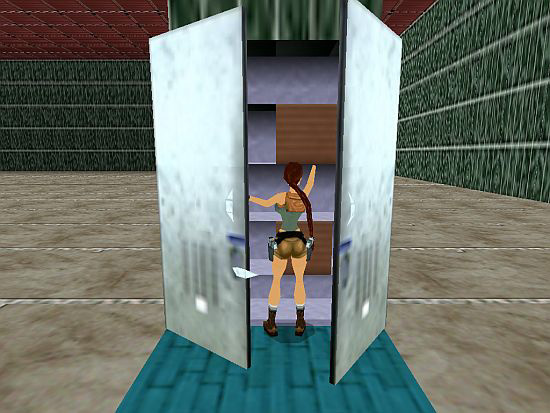 So the cupboard is in your WAD, with its and Lara's proper animations. Place the items Lara will get from the cupboard, on a square. Then place the cupboard (SARCOPHAGUS) on the same square. - Place the cupboard on a square - but don't place any pickable item there! It seems some exported AnimCommands - just as the one, for example, we wanted to use to stop the animation of the cupboard - don't work well if you attached them to a frame having bigger ID than 255. While the cupboard animation is 312 frames length, and that's why we want to use Frame#311 now. That's why we won't export AnimCommand now, but put that (Animation0-stopping) trigger into TriggerGroup#15, and put the TriggerGroup into GlobalTrigger#6. And, if Lara's just performing Animation11 (see TriggerGroup#14) then the GlobalTrigger activates TriggerGroup#15, stopping Animation0. Why? Well, the animation that follows Animation481 is (see: Animation Editor of WADMerger) Animation11. So, if Lara has just ended Animation481 and started Animation11 then Animation0 of the cupboard will stop. - And, if Lara starts opening the cupboard doors again, she starts the animation of the cupboard again - from its beginning -, activating TriggerGroup#12 again. But, read carefully: the animation of the cupboard won't start from its first frame exactly but 'only' from its beginning. But it's only important when Lara opens and shuts the doors again and again, because much performance means 'many times one', i.e. many frames slip. - But why would she do that? 1. Lara's cupboard-using animation starts with her trying to open the drawer under the cupboard doors. She opens the doors only after that. It's a bit lame if she's performing the animation again: she tries the drawer before opening the doors. But now she should know the drawer won't open, right? - This little imperfection could be skipped easily with some imagination. For example, 'Lara's very self-willed that's why she tries and tries again: she hopes the drawer will open sooner or later'. It's more interesting when she opens bigger cupboard doors, without a drawer. Because Lara uses the same animation. It means her 'trying the drawer' deed is 'trying the lower part of the door' deed in this case. So it looks this way again and again: 'she tries the lower part of the doors before she opens the doors at their middle parts successfully'. Re-edit Lara's animation if it bothers you. 2. Lara performs Animation11 in a lot of other cases, not only after Animation481. But it doesn't matter now. - For example, if you use one drawer and one cupboard, then you don't need FLIPEFFECT triggers to locate the areas of the GlobalTriggers, because both objects will use different Lara animations, i.e. the conditions of the GlobalTriggers are not the same. So the areas can be overlapped now, if you want. a, You will use AnimCommand and TriggerGroup, but you use 'found index' nowhere for the stops. For example: you use one drawer from ANIMATING2 slot, two drawers from ANIMATING3 slot and two cupboards from ANIMATING4 slot. In this case you have to export an AnimCommand (with 'No') of that ANIMANTING2 drawer to the Animation0 of ANIMATING2, one AnimCommand (with 'No') of each ANIMATING3 drawer to the Animation0 of ANIMATING3, deleting the stopping AnimCommands with 'Yes' from those animations. b, You use the original version of TriggerGroup#12 (with one trigger and TGROUP_USE_FOUND_ITEM_INDEX), but you don't use either 'Yes' or 'No' stopping AnimCommands at all. It seems the easier version but in this case you will notice that slip problem at all the drawers. Using TGROUP_USE_FOUND_ITEM_INDEX at the starter TriggerGroups (see #3, #12) couldn't be problematic now. 5. Feel free to develop a method where you always stop the animation of the cupboard exactly at the last frame, using an Organizer, to fix the slip. - As Lara won't open the same cupboard a million times, then I think this experiment would be only waste of your time. - Put the shelf-using TR5 Lara animation (466, see, in the WAD of TR5 level 'Streets of Rome') into a new animation slot of your WAD (for example, Animation482). - Put the shelf object (i.e. a rack of shelves, you can find one, for example, in the above-mentioned WAD) itself into an - any - ANIMATING slot (for example, ANIMATING5). - It doesn't have any animation so you don't have to adjust anything in that now. - Use the proper commands in Script. - It's almost the same as the setup of the drawer or the cupboard. But this time the Organizer won't start an animation for the shelves, so there isn't TriggerGroup/AnimCommand to stop the shelf-animation either. 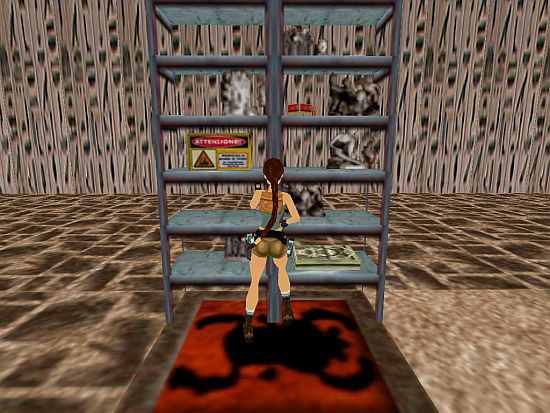 I mean, Lara stands close to a rack of shelves, facing that, according to TestPosition#4. She's still and doesn't have anything (a flare, at most) in her hands. The player hits CTRL so that Animation482 of hers ('looking through the shelves') will start. After two seconds (see Organizer#4), when Lara's just examining the middle shelf, she finds a big medipack there, thanks to TriggerGroup#18. 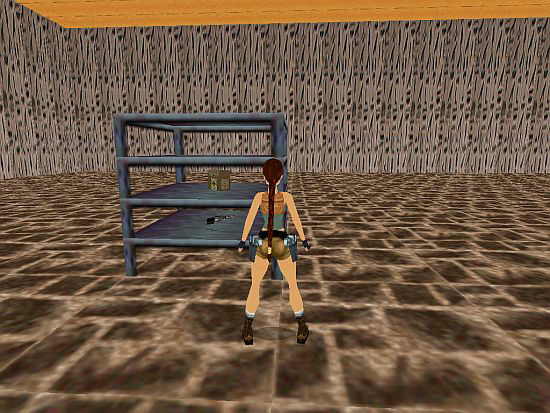 After newer one second (see Organizer#4), when Lara's just examining the lower shelf, she finds a revolver there, thanks to TriggerGroup#19. - After that she also looks through the upper part. But how will she get the items off the shelves? So, for example, when Lara's looking through the lower shelf then the 'One Shot' type TriggerGroup#19 will be activated. It means $5000, 4, $150D trigger makes the revolver invisible then $2000, 48, $16B trigger puts the revolver into the inventory - just as if Lara had been getting that off the shelf. 1. There isn't reaching into the backpack at the end of the animation. 2. The pickable item, after it's become invisible, still has its collision, but it doesn't matter now. 5. If you want Lara to see the item she's just getting from the cupboard, then place the item in one of the cupboard shelves, and use a $5000, X, $150D trigger in TriggerGroup#13 (see above). Or, if you don't want Lara to see the item she's just getting off the rack, then don't place any item there, and don't use $5000, X, $150D triggers in the setup of the rack. So there are no GlobalTrigger areas if you use more empty racks. (GlobalTrigger#8 is not a GlobalTrigger of a rack, it's a general GlobalTrigger for the weapons.) But if you use, for example, one empty and one non-empty rack then you must locate the area of the non-empty rack so that it won't be overlapped with the area of the empty rack. Seeing the script of the drawer, you should find out the script for more or different racks. And the script of the cupboard will tell you about mixing the objects, if you want to use a rack, and a drawer/cupboard.